We design, implement and host web based technology, in this section we briefly look at the services we provide for websites. We basically provide two types of website, one for standard brochure ware and another bespoke service for more in depth work, our particular speciality is large data sets and seriving them to an audience in such a way as they can get the most from it and what they need quickly. We spend most of our time designing ad developing high powered sites that have the full semantic capability. These sites are best suited to organisations that have a lot of information that they need to disperse, often to disparate audiences. They are very flexible and extendable with a fully integrated CMS system. 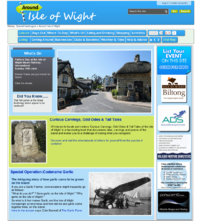 For an example of what they can do please visit [http:www.aroundisleofwight.info Around Isle of Wight] by clicking on the picture or browse through the sections listed here. We are happy to talk to you so if you would like a demonstration please contact us to see if what we do fits what you need. We do standard brochureware sites with as many pages as you need and the CMS system. Designed for a very competitive rate, these can be bespoke to your needs or you can have one of our predesigned templates. You are in control of the content and site materials and the sites are extendable for your needs without needing to get us involved. Whether you are looking for a website or intranet, we design, project manage, host and maintain sites on behalf of our clients. If you need a single service we can also provide that or any combination. Our area of expertise is in Semantic Mediawiki, which is an open source platform that has a global following.